Looking for the best deer feeder? We’ve done all the leg work for you and identified the best deer feeders for many people’s needs. Whether you’re just looking for a bucket feeder or you’re wanting a high-capacity hanging feeder, you’ll find what you’re looking for. We’ve even picked out the best gravity deer feeder and the best cheap deer feeder for budget-minded outdoors enthusiast. I think the Moultrie Deer Feeder Pro offers some of the best bang for your buck that you’ll find among automatic deer feeders. It’s got an easy to program digital timer, large feed capacity, varmint guard, and helpful digital indicators that make it user-friendly and low-maintenance. Moultrie’s Deer Feeder Pro is a great choice for people who are looking for the best all-in-one ready to go deer feeder. Being easy to setup, program and use makes it an easy-access solution that promises no hassle setting up in the field with no tools required. After you unlock the bottom set of legs (requires no tools), the hopper stands only 5.5 feet tall.You can fill up the hopper without needing to bring a ladder, stepladder or truck to stand on when pouring the feed in. Speaking of feed, the hopper holds up to 200lbs of feed giving it a great capacity, saving you many trips refilling the feeder. Programming the timer is very easy, with a large easy to read LCD screen and multiple options for feeding times and amounts. You can choose to feed up to 6 times per day in intervals up to 30 seconds each feed. There’s also a battery-indicator and feed-level indicator giving you quick at a glance information about the feeder, saving you maintenance time and hassle. This feeder’s motor uses a 6-volt box battery that will need to be bought separately. The feeder is power efficient, meaning the battery should last at least a few months before needing to be recharged. If you’re looking for a more hands-off solution power solution, Moultrie sells a that plugs into the external power port and charges the battery. You likely won’t need to replace the battery at all if you choose to pick up their solar charging kit. Once this feeder is setup, you can forget about it until your ready to put in more feed. The built-in varmint guard does a great job at protecting against squirrels and raccoons. Underneath the funnel is also a rounded cone near the spinner so feed doesn’t accumulate on the spinner and attract varmint. You’ll find the feed covers a large area when spread too. There’s no setting for feed spread, but you won’t have to worry about spreading feed too closely and having bunches underneath the feeder, causing the deer to bunch up. Overall, I believe that the Moultrie Deer Feeder Pro is one the best automatic deer feeders for the money. Being very user-friendly and easy to setup makes it a great choice for those that don’t want to go through the hassle of installing a feeder on their own bucket and deploying it in the field. The tripod allows you to set it up anywhere you please and the large 150lbs capacity hopper means you won’t need to worry about filling up the feeder every other week. Being able to use a solar panel kit to charge the battery practically eliminates any worries about running out of juice while it’s feeding, even for folks who like to feed deer year-round. If you’re after one of the best all-in-one automatic deer feeders and looking to get the most for your money, I’d recommend you check out the Moultrie Deer Feeder Pro. Moultrie’s 30-Gallon Pro Magnum deer feeder offers a huge 200lbs capacity, durable metal feeder with varmint guard and an easy to program timer that makes it a great hanging deer feeder. Anyone who’s in the market for a hanging deer feeder needs to check out this awesome deal from Moultrie. One thing that sets this deer feeder apart from other models is its all-metal housing, barrel, spin plate, varmint guard and funnel. Metal makes these parts very durable and sure to last for a long time, except for the lid that is. The lid snaps on and locks into place with a drum lock but doesn’t have anywhere to put a real deal lock on the lid, like what is required in Texas. One downside of the all-metal construction is that the lid is made of metal. Now, if the lid were cone-shaped or dome-shaped, having a metal lid wouldn’t be an issue. However, the lid is convex. Think about this for a moment, a convex metal lid, that will collect rainwater which will sit on top causing it to rust and break down much faster than it ever normally should. See the issue? Now don’t freak out just yet, even though some bonehead working for Moultrie thought this was acceptable, there’s a solution. Spray some Flex Seal or truck bed liner on the lid and let it cure. The lid will be significantly more rust resistant and be problem free for years down the road. Whenever someone asks you why you’ve got truck bed liner on top of your deer feeder, just make sure you mention Moultrie’s genius designers in your string of expletives. Let’s bury this lid issue and move on. This feeder comes with an easy to program digital timer that has a large LCD display making it easy to read and program. There’s many customization options supprting up to 6 feeds per day ranging in duration from 1 second to 20 seconds. A feed level-estimator and battery-level indicator keep you informed about the status of your feeder, cutting down on maintenance time and helping you keep your feeder running smooth. The Mangum Pro uses a 6-volt box battery and even supports using two batteries for a longer battery life. While the batteries last several months anyways, you can extend the battery life nearly indefinitely with Moultrie’s solar charging kit that plugs right into the side of this feeder’s external power port. If you’re worried about varmint guards, let me say that I honestly believe Moultrie’s has done one of the best jobs of any feeder I’ve seen. You’ll find the all-metal varmint guarding cage protects the feeder’s spinner and funnel from any funny business that squirrels, racoons, or birds try to pull. Hanging the Pro Magnum deer feeder is done via the metal hardware on the outside of the barrel. There’s a spreader bar inside that attaches to the I-Hooks on the outside that you can run rope, chain or cable through to hang it. Or if you’re a bit craftier and want to make your own spreader bar, there’s plenty of opportunity to throw together some 2×4’s and run chain through the metal I-Hooks to your homemade spreader bar. Moultrie also makes their own spreader hoist for hanging feeders that actually seems to qork quite well. Finally, this feeder comes with a lifetime warranty that should cover anything breaking as a fault of build quality or materials quality. Overall, I think the Moultrie 30-Gallon Pro Magnum deer feeder is one of the best hanging deer feeders that you’ll find anywhere. All-metal housing and construction makes it resistant to weather, except in the case of the lid which can be fixed with a coat of truck bed liner. I really wish Moultrie did something about the lid, but it’s a problem that is easy enough to fix with some truck bed liner and an afternoon. Varmints should be a non-issue since this deer feeder has one of the best varmint guards I’ve ever seen. If you hate squirrels and racoons chewing through your old feeders and stealing your feed, you’ll appreciate the armored feeder on the Pro Magnum. Throw in the ability for near indefinite battery life with a solar charging kit and a lifetime warranty and I’m sold on this hanging deer feeder. 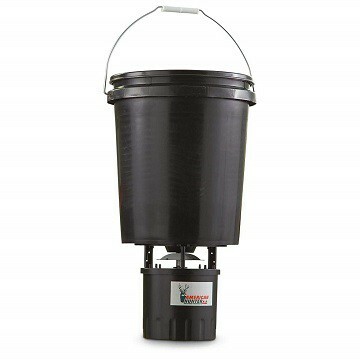 If you’re after the best hanging deer feeder for the money, check out the Moultrie 30-Gallon Pro Magnum deer feeder. If you’re wanting to use your own hopper for your deer feeder or if you’re wanting to replace a motor and timer on an old deer feeder, check out the Moultrie Pro Magnum Deer Feeder Kit. If you’re looking for one the best full-featured digital deer feeders, look no further than Moultrie’s Pro Magnum Deer Feeder Kit. A large LCD screen makes programming the digital timer simple and easy. The timer supports feeding up to 6 times per day with feeding intervals ranging from 1 second up to 20 seconds in duration. The built-in feed level estimator helps you keep track of how much feed is in your hopper at a glance without needing to manually check. A battery-level indicator does the same for the 6-volt box battery that this feeder takes. This feeder has an external power port and includes connectors for a solar panel if you wish to solar charge your batteries for an indefinite battery life. Moultrie sells a solar kit that is perfect for using with their feeders. Speaking of batteries, you can choose to use either one or two box type 6-volt batteries to extend the battery life even further. This power efficient feeder doesn’t need two batteries, but you may deem it necessary if you choose not to use the solar kit and don’t want to change the battery every few months. If you’ve had varmint problems in the past, you can put those to bed for good with this feeder’s durable all-metal varmint cage that keeps the critters out. There’s way for squirrels, birds, racoons, hogs or bears to get at this feeder’s all-metal spinner or funnel. Included with the feeder is all the hardware needed to fit the it to nearly any contained of your choosing. While Moultrie claims this feeder comes with a mounting template, there’s many who can can prove otherwise. If you order this feeder and don’t get a template in your box, you’ll need to request Moultrie send a pdf or physical copy to you. If you’d rather not be hassled with getting the template, figuring out how to mount the feeder isn’t too hard with the hardware included. A few holes, washers and wingnuts later and you’ll ready to deploy your deer feeder. Moultrie backs the metal housing with a lifetime warranty, but it seems the timers are only warrantied for two years. Not a bad warranty at all, I know many who offers much less in terms of customer satisfaction. Plus, the timers seem durable and weather-resistant sealed inside their cover. A two year warranty is nothing to sneeze at either. Overall, I think Moultrie’s Pro Mangum Deer Feeder Kit is one of the best full-featured digital deer feeders you’ll find anywhere. The super durable metal housing and metal varmint guard keeps out critters who want to steal your feed. They’ll never get through the tough steel cage around the metal spinner and feeder funnel. A large LCD screen makes programming quick and easy while also showing helpful information such as feed level and battery level to help you keep your deer feeder running smooth. Having the option of solar charging is a big plus and a real luxury I’d recommend to those who never want to worry about the battery life of their feeder. Sporting a lifetime warranty and a two-year warranty on the timers, they’re ahead of the game of many other manufacturers don’t even come close to offering guarantee on their products. My only real gripe with this deer feeder is that it doesn’t come with the installation template that Moultrie claims it does. Many people have said the same and can vouch for the absence of Moultrie’s installation template with their purchase. This isn’t too much of an issue though, as installing the feeder is easy and only takes a little reasoning with the hardware they give you. If you’re after the best digital deer feeder on the market, I recommend you check out the Moultrie Pro Magnum Deer Feeder Kit. Redneck Outdoors’s T-Post Gravity Deer Feeder is a simple yet effective deer feeder that becomes the perfect gravity deer feeder with a simple DIY trick that keeps the critters out for good. I chose this as the best gravity deer feeder for its easy to setup design that attracts deer, wastes little feed, includes everything you need for mounting and requires little maintenance once setup. A benefit of a gravity feeder is that you’re conserving corn since the deer will eat as much as they please without having any stolen or spread around on the ground to feed the squirrels, birds, racoons, hogs and other varmints that might otherwise get into your feed. Heavy-duty weather proof plastic is used for most everything on this feeder giving it a rugged design that is sure to last for many years to come. There’s no worrying about keeping batteries charged or setting timers like you would with automatic feeders. Despite being a gravity feeder, this deer feeder holds a whole lotta feed. You can easily filly it up with up to 80lbs of corn or your feed of choice. It’s easy to refill too, simply remove the plastic lid on the top and pour feed more in. You can also strap down the top or modify to lock with a few tools and some common hardware if your local laws require you to lock your feeders. The secret is to go to your local hardware store and get a piece of 6-inch diameter PVC pipe the length you want the bottom of your feeder to stand tall. You’re going to put the T-post in the ground through the PVC pipe so that it covers the post base. Since you got the PVC pipe the same length as the height you want your feeder to stand, it’ll slide right over the post sticking out of the ground and cover it from any critters who will try to climb it. The result is a gravity feeder that only the deer can get to. Squirrels and raccoons will have no luck climbing on this post if it’s in an open area, they’ll just slide right down to the bottom as soon as they try to climb the smooth PVC pipe. Birds will have a real tough time getting to your feed too unless they’re very tiny birds that may pick away only a few pieces of corn. But consider this thought exercise: which is going to cost you more in corn? An automatic feeder that sprays maybe a pound of corn a day to feed any critter or varmint that comes along? Or a gravity feeder than only the deer can reach and eat their fill, while also feeding the occasional tiny bird? It’s easy to see, you’ll save a lot of money in feed cost with this gravity deer feeder. Overall, this gravity deer feeder is super tough, super cost effective, requires little maintenance, and can feed only the deer as much as they want to eat! I hope you love this deer feeder as much as I do. If you’re interested in this deer feeder I recommend you check out the Redneck Outdoors gravity deer feeder. I love this gravity deer feeder. It’s my favorite out of all the deer feeders on this list. I’d recommend you mount this feeder on a T-post instead of a tree. While it does have a convex back that allows you to ratchet it to a tree, I have a little DIY trick that can help you make the most of this feeder. If you’re after the best cheap deer feeder, I’d recommend you check out the American Hunter 5-Gallon Digital Hanging Bucket Deer Feeder. It’s got everything you need to get started feeding deer without sacrificing too much in terms of quality and features for an automatic digital timer deer feeder. American Hunter’s 5-Gallon digital bucket deer feeder is a great choice for budget-minded outdoors enthusiasts who are looking to feed their deer without breaking the bank. This hanging deer feeder has an adjustable digital timer that supports feeding up to 16 times per day in intervals between 1 second and 30 seconds. There’s plenty of room to store feed in the bucket, with it being able to support up to 40lbs of your choice feed. It’s got plenty of power too, being able to sling feed about 15 feet in every direction even when it’s only hung about 3 feet off the ground. You’ll need to buy a spring type 6-volt battery separately for this feeder, but it should last all season and then some. The durable weather-resistant plastic bucket holds feed and protects it from the elements. There should be no issue with the feed soiling, as this bucket has a water-tight seal and durable plastic that braves the elements with ease. Depending on how high, where and how you hang this bucket, it can be difficult for squirrels and racoons to get the feed. If you hang it on a post with some PVC around it, then you shouldn’t have to worry about any squirrels, racoons or birds getting into the bucket, they’ll just have to eat any scraps off the ground instead. Be warned however, there is no varmint guard for this feeder. You can make your own if you don’t want to buy one for this deer feeder, as they can be rather expensive and hard to install. One way to manage would be to build a cage of large gauge chicken wire or attach a metal cage you have laying around over the spinner. Overall, I think this is one of the best cheap deer feeders you’ll find. Refilling the bucket can be a bit difficult, as there’s a ring lock on the inner lip of the bucket lid that makes it a pain in the rear to get off. It may seem like it’s glued on there, but trust me, it comes off. No varmint guard means you may want to be a bit careful where you hang this feeder, although you could make your own provided you’re willing and crafty enough. The durable plastic bucket should hold up great against any weather that comes around, and the plastic is tough enough to ward of most squirrels trying to chew through to the feed. Be wary though, I’ve known some persistent squirrels that could have a chance at getting through after a few weeks. Probably because their brains are thinking about bathing in the feed inside like Scrooge McDuck in his vault. Given the low price this feeder goes for, I think it’s a great deal for a hanging deer feeder with automatic feeding and a digital timer. The large capacity, long battery life and all-in-one package makes this a great choice for those who are wanting the best cheap deer feeder. If you’re interested, I recommend you check out the American Hunter 5-Gallon Digital hanging bucket deer feeder.